Do you love sightseeing? Are you searching for thrilling and breathtaking landscapes? Do you like the idea of having so many choices you, it would be difficult to make a decision? If all the answers are yes, I have good news for you. São Miguel is the right place for you. São Miguel is the biggest island of the Azores, the archipelago of Portugal. It is known also as “Ilha Verde”, for its super rich natural life (there is an incredible variety of flora and fauna) for it’s volcanic origin and also for being recognised as one of the few places where tourism and human life is fully sustainable (no doubt this is the ideal place for people who love to discover amazing landscapes and to protect the environment). These are among the reason for which São Miguel has been included in the Unesco world heritage sites. After this brief overview I bet you want to know more, so let’s explore a possible holiday on this beautiful island. How to get to in São Miguel? To arrive in the Azores, this volcanic archipelago located in the Atlantic ocean, west from Portugal, there is essentially one way, by plane (to give you an idea of the distance of the islands from the continent, just consider that Lisbon is 1,643 km (1,021 miles) away). Despite being quite far away, lost in the sea, the increasing number of direct flights provided by some companies like TAP Air Portugal (the official Portuguese airline) and Sata (official Azorean airline) have made it super easy to get to the Azores. That are generally more expensive but that will allow you to spare a lot of time travelling. 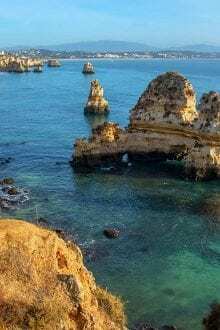 It takes on average two hours and a half from Lisbon to get to the island, the only thing that might be taken into consideration is that the prices of the flight are usually high throughout the year, especially in summer they never go below €100 with peaks of €220. Only from September onwards, the prices are more acceptable. 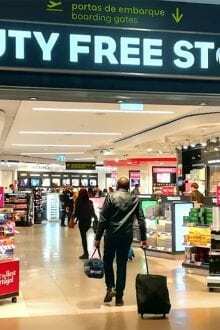 You might spend no more than €70 (the season plays a great role in determining how much you are going to spend on a flight). There is also a direct flight from Porto to São Miguel, but there is no significant difference with the one you can take from Lisbon. It is always two and a half hours long. This flight costs more than €100 throughout the summer season and it is provided by the same airline companies. So the only real difference is where you want to spend time before landing on the most important island of the Azores. the colourful Lisbon or Porto, the Douro pearl. However, if you enjoy cruises, and you have a lot of time to spare, there is another option to get to the Azores that it is less traditional and more adventurous. From Lisbon (and from other cities as well), there are many different cruises you can choose from to reach this unique destination. If you have ten or more days, I would suggest you pick the tour that passes through Madeira before reaching São Miguel. Starting the cruise from the city you prefer (as I said, Lisbon is just one of many choices you have), this option offers you the possibility to experience an incredible variety of cities to land to, cultures and sceneries, from the open horizons of the Azores to the golden beaches of Porto Santo in Madeira. You will have a set of unforgettable memories that you will remember with a big smile on your face. However, I have to say that cruises are very, and when I say very, I mean very, very expensive. Their prices stretch from €2,000 to €4,000 depending on how many people are joining you. If a cruise for you, have a look at the offers from Seascanner here. If you would like me to suggest to you what is the best option, I would definitely say fly. Choosing this way, you will save so much money that you will have the funds to plan another holiday. There are many attractions you might see in São Miguel. It offers so many things to choose from that it is likely to satisfy the most discerning palates. 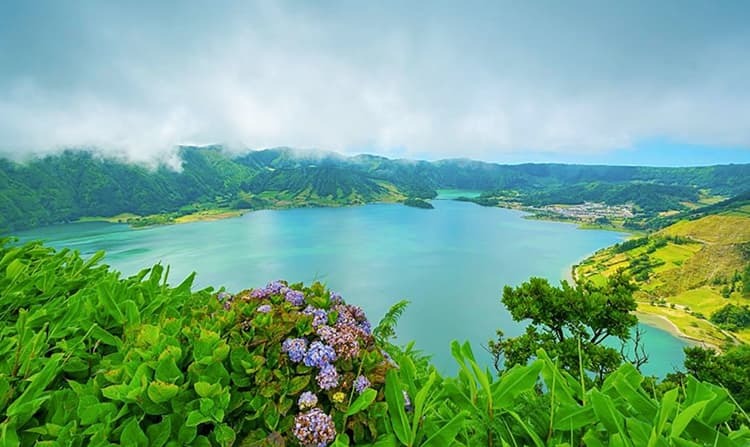 The most iconic attraction to see on the “Ilha Verde” is Lagoa de Sete Cidades, the volcanic crater filled with a lake whose water is so blue that you might end up confusing it with the sky. Created from the tears for a forbidden love between a shepherd and a princess, the lake can be seen from the King’s View lookout. It’s a stunning view you will remember all of your life. Lagoa das Sete Cidades is a protected landscape, considered to be one of the Seven Natural Wonders in Portugal. If you are a courting couple, if you are trying to find the best place to propose or even if you are just a very romantic person that loves to admire the sun rising from the ocean to the sky, Ponta da Madrugada and Ponta do Sossego lookouts are the best places in on São Miguel to do it. Even if it might require a lot of psychological strength, since you may be required to get up early in the morning, you are going to be amazed by the beauty of the sunrise. Its light will make the ocean a melted gold plan, giving you the possibility to see something close to what people see in heaven. 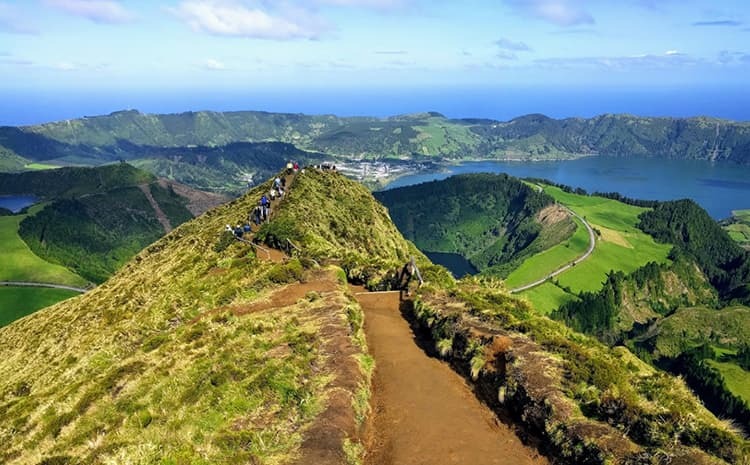 Originally known as Lagoa do Canário lookout since it’s a few steps away from Canário lake, Miradouro da Grota do Inferno offers a breathtaking view of Lagoa das Sete Cidades. It is becoming more and more popular, so my suggestion is to get there early in the morning to avoids crowds of people that might you prevent from enjoying the 360 degrees view of São Miguel and its treasures. Miradouro da Grota do Inferno, São Miguel. Are you planning a quick trip to São Miguel? Why not take a guided tour of the whole west side of São Miguel? Take in all the highlights like Sete Cidades, Fogo Lake, Caldeira Velha, Ribeira Grande town, the pineapple greenhouses and more. Learn about the island’s nature and history from an expert guide. This tour books out fast so plan ahead and click here at Get Your Guide to book your tickets from only €59 per person which includes lunch and entrance fees. Lagao do Canário is a little lake that was created in a small crater that is surrounded by a dense forest, as if it was was a blue pearl protected by a green shield. It is known worldwide as “Snapchat lake” since its shape resembles the logo of the app. It’s the ideal place to find peace and serenity, so it’s ideal for people that want to take a break from the word and their fast-paced life. Lagoa do Canário, São Miguel. 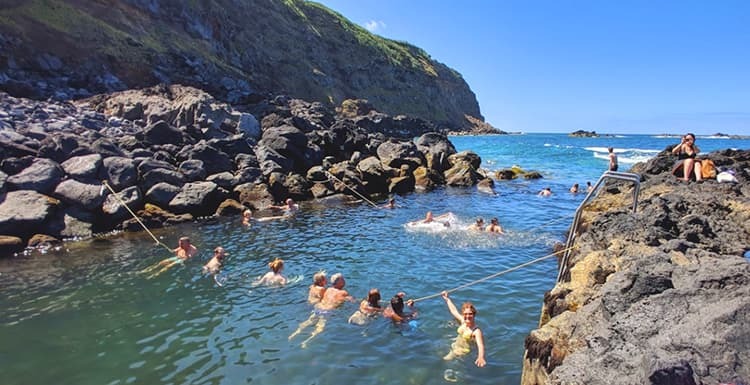 If you are a busy business person that struggles to find some peace, or if you want to get rid of the stress of your nine to five job, São Miguel is the right place for you because, among the landscapes you will also find some spas and bathing sites. Ponta da Ferraria’s natural therapeutic waters have been regenerating stressed people since the 15th century and they will help you to forget the moments spent in the office. Ponta da Ferraria, São Miguel. 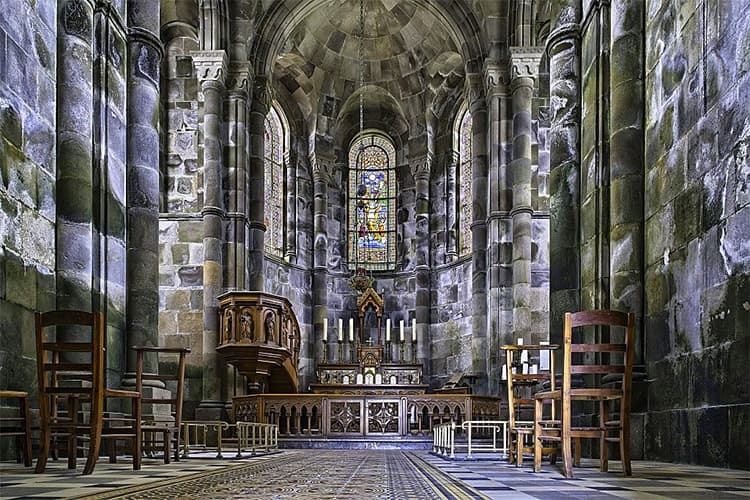 You remember that I mentioned that you can see very impressive gothic buildings in São Miguel, the Chapel of Nossa Senhora das Vitórias is one of them. Reflecting itself in the pure waters of the lake, this chapel it’s one of a kind in all the Azores. In the chapel is buried José do Canto, the person that wanted to build this magnificent example of gothic architecture. Chapel of Nossa Senhora das Vitórias on São Miguel island. If you love to visit churches, another remarkable place you have to visit is Church of Our Lady of the Rosary. The church was built over another older chapel, erected probably in the 13h century, It is known for it’s ancient and magical a pipe organ and the three sets of columns that dress up the main body of the church. 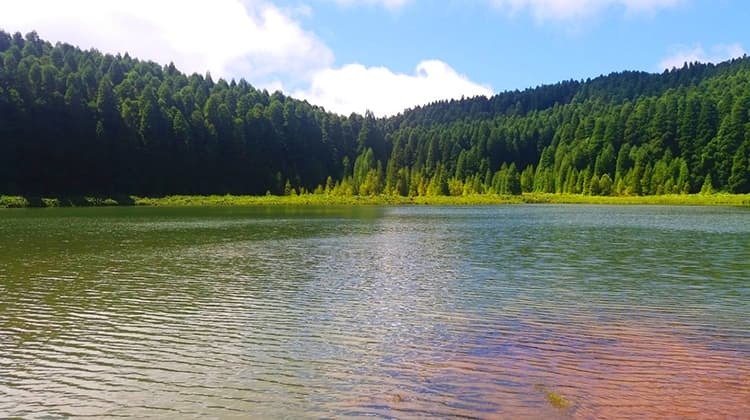 On São Miguel, there are a lot of paths that will bring you to lakes and view points that will provide you with the best memories of all your life, but it’s not only about that. 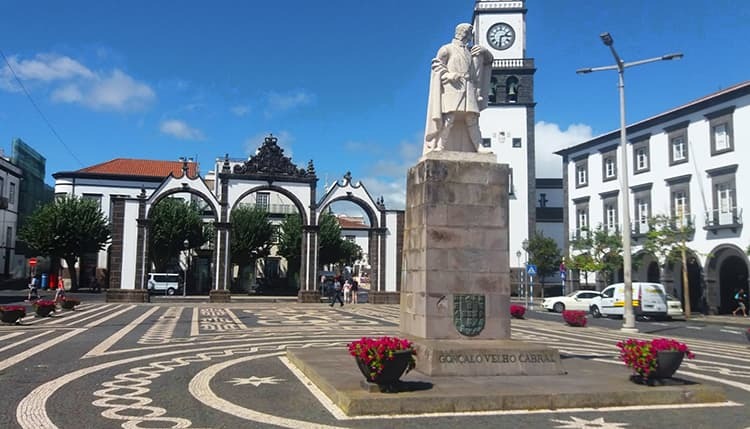 The capital of Ponta Delgada has much to offer for people willing to give it a try. 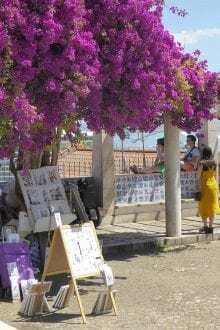 You can walk on the “Avenida”, a long street along the sea, try some fancy food in the numerous bars and restaurants in the town or visit Mercado do Graça, the typical and colourful farmer’s market. There are so many things to do, you will probably need to dedicate a couple of days to Ponta Delgada itself, in order to try them all. 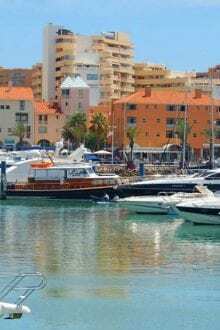 Pico de Barrosa is a mountain near to the capital, one of the few places where you can see both the south and the north of this island, admire the sea, the lakes and the capital itself. 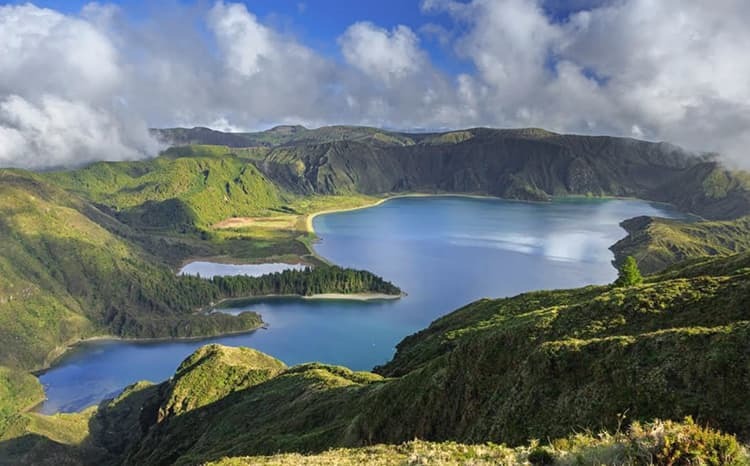 Lagoa do Fogo‘s name refers to the fact that the lake was created in a volcanic crater. Being a natural reserve since 1974, it’s the ideal choice for people that love to hike. There are a lot of hikes of different difficulties that will allow you to have amazing views of the lake. Lagoa do Fogo, São Miguel. These are just some tips, but believe me, São Miguel is filled with attractions. From whale watching to romantic gardens, there is so much to choose from that nearly every taste can be satisfied. Have you always wanted to go whale watching? There is a fantastic tour from Get Your Guide here that will take you out around Azores waters with real biologists, conservationists and naturalists who will explain everything you wanted to know about the beautiful animals and their habitat. Prices start at only €55 per person for the three-hour boat trip. Make sure you book early by clicking here. But what about a place to stay? 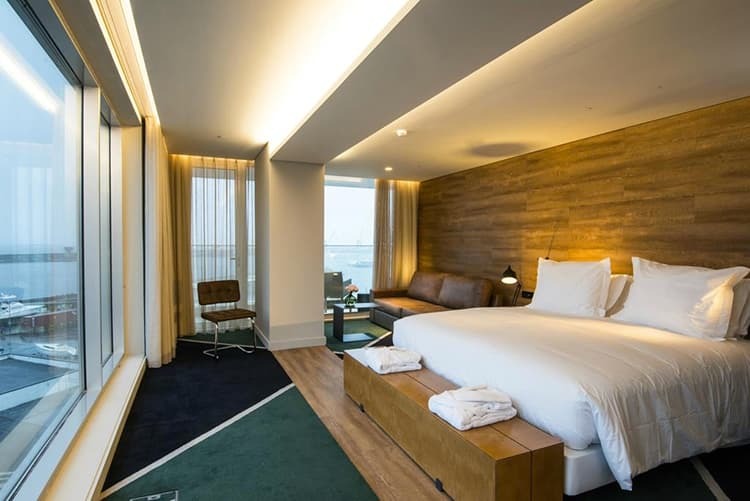 Depending on how big your budget is, there is a wide choice for you, from top rated hotels to some fancy hostels that allow you to save some money while having the best time of your life spending your holidays here. The Azor Hotel located in the capital, Ponta Delgada, offers more than 100 rooms with a stunning view of the sea. There are a lot of facilities like an indoor pool, a spa and the possibility to arrange some outdoor activities to explore all the hidden treasures of São Miguel. Since it’s a top quality hotel, it is expensive regardless of the season, but the stay will be so magical, that the money spent is worth it. Prices start at €442 for two nights. For more details and to book, visit this hotel on Booking.com here. Azor Hotel on São Miguel, Portugal. Grand Hotel Açores Atlântico is the best rated hotel in Ponta Delgada. The answer is simple. it has a classic design, inspired by the style of the European Grand Hotel, it is in front of Ponta Delgada’s marina with an unforgettable view of the sea and it has a lot of services like an indoor Pool. 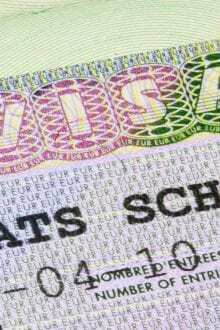 Again, it is very expensive, so be prepared to sacrifice part of your budget to book the stay as prices start at €342. Check out the best deals from Booking.com here. If you want to save some money all the time, like me, but at the same time, you want something cool, 1ofushostel B&B is the perfect choice for you. It’s a hostel, so you know you are going to save a lot even if you book in the high season, but it provides so many services that, in my opinion, it can challenge the top quality hotels. This hostel also offers you a shuttle service to the airport, a barbecue area in the garden and the great advantage to be located near Portas da Cidade. Prices start at €78 for two nights and they always have deals on offer on Booking.com here. If you are going to São Miguel with your family, I would suggest you try these magnificent Airbnb apartments. Chez Danny is a mini suit where you can have rest after having toured the island, spending not more than around €45 per night regardless of the season (cleaning fee excluded). Apartment S. Miguel is a very nicely furnished apartment in a convenient position where you are going to spend around €55 a night even if you have booked for four people. That’s the reason why, if you are a family you definitely need to give these options a try. After having seen all the hot spots of São Miguel, found a place to stay, I bet you want to know something about the weather. So, let’s dig in. Did you like this article? Don’t miss out on more like this by signing up for our newsletter here. It’s very difficult to pick out a season that it’s clearly the best option. Of course, the high season offers, in general, higher temperatures and sunny days, but it is not entirely true for São Miguel and the Azores. The weather can change so fast that you can have four seasons packed in one day or few hours. However, as I said, if you want to have the chance to find more sunny days, you will have to opt for the summer months and also for September, knowing that it will be more expensive and that São Miguel will be filled with tourists. For a more detailed look at the weather in the Azores, click here. After this quick overview of São Miguel, I am sure you are curious to taste some of the attractions of this beautiful island. I bet it will take only three points of view to make you fall in love with the Azores! Discover more about the Azores here.